Last year, an investigative report about China’s illegal market of “empty package scalping” (空包刷单) was released by The Beijing News (link in Chinese) which we also covered. It explained how shop owners on Taobao and Tmall inflate their sales statistics though fake package deliveries by using “empty package” service websites and delivery services. So how does Alibaba keep merchants from falsifying sales data? Alibaba just recorded total GMV of RMB 168.2 billion (more than $25.3 billion) on this year’s Singles’ Day. There was speculation that GMV numbers would be a bit more rational for this year Singles’ day, as Anti-Unfair Competition Law came into effect. Just days ahead of Single’s day, the standing committee of the National People’s Congress passed changes to the Anti-Unfair Competition Law introducing new provisions that ban false or misleading advertising about a product’s features, functions or quality, forbid falsifying sales data, user comments and awards, and prohibit “organizing fake transactions” that amount to false or misleading commercial publicity. When we asked Alibaba, “How much of those orders are legitimate? Were there any empty boxes?”, Alibaba spokesperson said the ‘empty package scalping’ was reported in 2016, thereby the information is outdated. “Alibaba has no tolerance for the practice of merchants organizing fake transactions, reviews, and ratings on our platforms. We continuously improve our algorithms to enhance our proactive detection capabilities and penalize merchants who manipulate transactions on our platform,” Alibaba spokesperson told TechNode in an exclusive email interview. 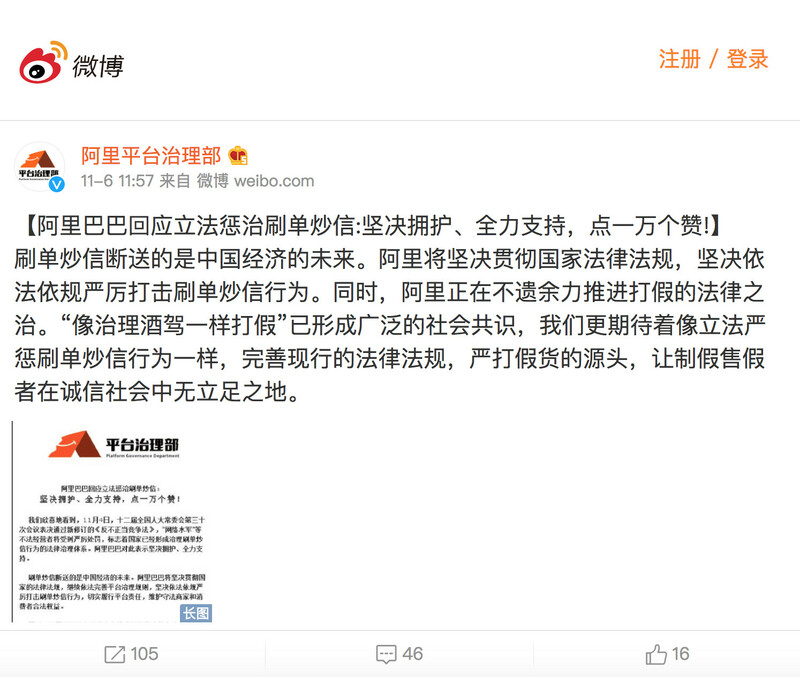 “Organizing fake transactions, reviews and ratings” (刷单炒信) ruins the future of China’s economy. Alibaba will resolutely implement the national laws and regulations, and resolutely crack down on the acts of speculation in accordance with the law. At the same time, Alibaba is sparing no effort to promote the rule of law against the counterfeit products. We have been expecting to establish a extensive consensus on social issues like this, and we are even poised to cracking down on counterfeit goods just like “cracking down on drunk driving,” that are strictly forbidden by law. We must crack down on the source of counterfeit goods and so that those who make counterfeit goods and fake goods have no place to stand in the society.